Of course the launch of Sputnik I in 1957 was a milestone in American history, and it was a turning point in Homer Hickam's life. Since 2007 is the 50th anniversary of Sputnik I, we thought we would assemble a few facts. First time Homer heard Sputnik's signal on the radio: Saturday, October 5, 1957, early morning. We enjoyed the Google header from October 4, 2007. They titled it "Sputnik - 50th Anniversary". In 1885 Konstantin Tsiolkovsky first described in his book, Dreams of Earth and Sky, how such a satellite could be launched into a low altitude orbit. It was the first in a series of four satellites as part of the Sputnik program of the former Soviet Union and was planned as a contribution to the International Geophysical Year (1957-1958). Three of these satellites (Sputnik 1, 2, and 3) reached Earth orbit. The Sputnik 1 satellite was a 58.0 cm-diameter aluminum sphere that carried four whip-like antennas that were 2.4-2.9 m long. The antennas looked like long "whiskers" pointing to one side. The spacecraft obtained data pertaining to the density of the upper layers of the atmosphere and the propagation of radio signals in the ionosphere. The instruments and electric power sources were housed in a sealed capsule and included transmitters operated at 20.005 and 40.002 MHz (about 15 and 7.5 m in wavelength), the emissions taking place in alternating groups of 0.3 s in duration. The downlink telemetry included data on temperatures inside and on the surface of the sphere. Since the sphere was filled with nitrogen under pressure, Sputnik 1 provided the first opportunity for meteoroid detection (no such events were reported), since losses in internal pressure due to meteoroid penetration of the outer surface would have been evident in the temperature data. The satellite transmitters operated for three weeks, until the on-board chemical batteries failed, and were monitored with intense interest around the world. The orbit of the then inactive satellite was later observed optically to decay 92 days after launch (January 4, 1958) after having completed about 1400 orbits of the Earth over a cumulative distance traveled of 70 million kilometers. The orbital apogee declined from 947 km after launch to 600 km by Dec. 9th. The Sputnik 1 rocket booster also reached Earth orbit and was visible from the ground at night as a first magnitude object, while the small but highly polished sphere barely visible at sixth magnitude more difficult to follow optically. Several replicas of the Sputnik 1 satellite can be seen at museums in Russia and another is on display in the Smithsonian National Air and Space Museum in Washington, D.C. The show Leave It To Beaver made its television debut the evening of October 4, 1957, the same day Sputnik 1 was launched! (1) Paul Dickson, Sputnik: The Shock of the Century, G.K. Hall & Co., Waterville, Maine, 2001, p. 193, Large Print Edition. (3) Homer Hickam, Rocket Boys, Delta Trade paperbacks, New York, 2000, p. 16. (5) We are not sure of the exact date. The event is described in Rocket Boys and occurs sometime between the day Sputnik was first discussed in Big Creek High School (October 7) and the date the Russians launched Sputnik II (November 3). (9) Dickson, op. cit, p. 104. (11) Based on the above article from NASA, it is likely the people of Coalwood would have seen Sputnik 1's rocket booster in orbit rather than the satellite itself. Sputnik: The Shock of the Century on pages 299 and 422! 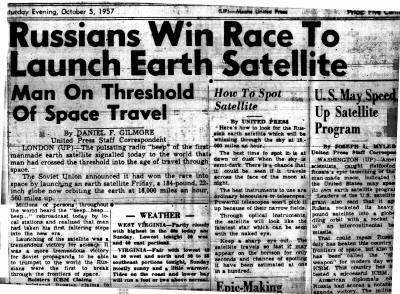 This is part of the front page of the Welch Daily News from Saturday Evening, October 5, 1957, the day after Sputnik I was launched. We would like to thank Eleanor Beckner from the McDowell Public Library for searching through the library's archives and providing us with this image. Actually, Eleanor provided us with the entire front page of that issue. We have typed all of the articles below to make them easier to read. Thanks, Eleanor! LONDON (UP) – The pulsating radio “beep” of the first manmade earth satellite signaled today to the world that man had crossed the threshold into the age of travel through space. The Soviet Union announced it had won the race into space by launching an earth satellite Friday, a 184-pound, 22-inch globe now orbiting the earth at 18,000 miles an hour, 560 miles up. Millions of persons throughout the world heard the “beep ... beep ... beep ...” rebroadcast today by local stations and realized that man had taken his first faltering steps into the new era. Launching of the satellite was a tremendous victory for science. It was a more tremendous victory for Soviet propaganda to be able to trumpet to the world the Russians were the first to break through the frontiers of space. It bolstered Russian claims to be the first to have perfected an intercontinental ballistic missile for it might well have taken such a missile to launch the satellite on its flight around the world every 95 minutes – about 15 times a day. John P. Hagen, the U.S. satellite chief, told the United Press in an interview in Washington the rocket that blasted the satellite skywards may have been “close to” an ICBM. Hagen, head of Project Vanguard, urged a speedup of the American satellite program, now set for a launching this fall. The Russians said more satellites would be launched later. They have said earlier that satellite marked the first step of travel to the moon and perhaps to Mars and Venus as well and said travel to the planets might well begin by 1965. The speed with which Russia carried out the launching amazed scientists throughout the world. One had been expected during this worldwide geophysical year but not for several more months. The first man to report seeing the satellite was Larry Ochs of Columbus, Ohio, one of seven moonwatchers alerted. In the Massachusetts Institute of Technology, a monstrous electronic brain began putting together the scraps of information which would result in exact knowledge of the satellite’s movements. The size and weight amazed American scientists. The American satellite is to be 20 inches in diameter and will weight 21 ½ pounds. Scientists said the 184-pound weight of the Soviet satellite was astounding. And indicated that a rocket nearly as powerful as one for an ICBM must have been used. The first satellite is expected to remain aloft only for a week or two then when it descends into the atmosphere of the earth its great velocity over a protracted period will cause it to burn like a meteor. The White House and Defense and State departments did not comment immediately but the unofficial attitude was that the development had no immediate effect on the balance of power. West Virginia – Partly cloudy with highest in the 60s today and Sunday. Lowest tonight 50 west and 40 east portions. Virginia – Fair with lowest 45 to 50 west and north and 50 to 55 southeast portions tonight, Sunday mostly sunny and a little warmer. Tides on the coast and lower bay will run a foot or two above normal. Stine, author of a recent book on earth satellites, spent five years on rocket testing and development at White Sands Proving Grounds in New Mexico and is now engated in secret design work at the Glen L. Martin missile plant at Denver. The missile scientists said that the Soviet satellite is so heavy that an intercontinental ballistics missile (ICBM) must have launched it. And a workable ICBM means the United States can expect no more than a 15-minute warning of attack, he said. Stine said the United States is behind the Soviet Union in rocketry, and has consistently underestimated Russian scientific capacity. “We have known in the rocket business for a long time that the Russians were pretty sharp,” adds Stine. “They took the German V2 after World War II and went into immediate production. We captured the V2s and fired them, but didn’t build them. Here’s how to look for the Russian earth satellite which will be whizzing through the sky at 18,000 miles an hour. The best time to spot it is at dawn or dusk when the sky is semi-dark. There is a chance that it could be seen if it travels across the face of the moon at night. The best instruments to use are ordinary binoculars or telescopes. Powerful telescopes won’t pick it up because of their narrow fields. Through optical instruments, the satellite will look like the faintest star which can be seen with the naked eye. Keep a sharp eye out. The satellite travels so fast it may appear on the horizon for only seconds and chances of spotting it have been estimated at one in a hundred. The voice was that of an American scientist, talking to other American scientists. They were in Room 717 of the Association Bldg. – the offices of the U.S. Committee for the International Geophysical year. A few hours before they had heard the news that Russia had launched mankind’s first artificial moon and taken man’s first real step into outer space. The stunning word came at a cocktail party the Russians had hastily called at their embassy, presumably to make the announcement. But the first word was given to the American scientists by U.S. newsmen who rushed to the party after Moscow radio broadcast news of the launching. The data poured into the offices in the Association Bldg. And was plotted on global charts stretching flat on a long table. The reports added up to confirmation: The Russians had done it. It was only at this moment, in the early hours of the morning, that the full impact of the Soviet achievement struck the men in Room 717. They had spent many months preparing to try to accomplish the same thing. They had wanted to be the first to conquer outer space. Although there was no race, supposedly, they thought they were ahead. They tried not to look disheartened as newsmen were ushered into the room. But their expressions didn’t quite match their words. WASHINGTON (UP) – American scientists, caught flatfooted by Russia’s epic launching of the first man-made moon, indicated today the United States may speed up its own earth satellite program. Leaders of the U.S. Satellite program also said that it appears Russia rocketed its heavy 184-pound satellite into a globe girdling orbit with a rocket “close to” an intercontinental ballistic missile. That could mean Russia not only has beaten this country to the frontiers of space, but also to what has been called the “ultimate weapon” for modern day war – the ICBM. This country has not yet tested a successful ICBM. American diplomats conceded Russia had scored a notable propaganda victory. The military implications of the Soviet feat were tremendous. President Eisenhower, who first announced plans for the U.S. earth satellite program July 29, 1955, was informed at his Gettysburg, Pa., farm of the notable Soviet “feat.” He had no immediate comment. 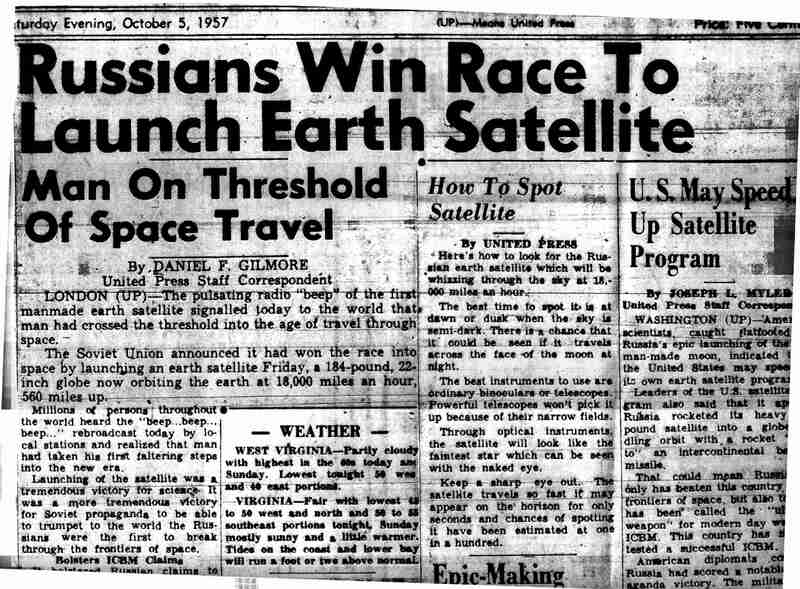 American scientists involved in the U.S. satellite were at a cocktail party at the Soviet Embassy here when Moscow radio broke the news. They rushed back to their headquarters and set in motion a U.S. and worldwide tracking system to trace the progress of the Soviet moon. Whey they came out of shock, the scientists said words adding up to fine, splendid, great. At heart, they were sick. The United States had done 90 per cent of the talking about earth satellites. Russia, it turned out, had done 100 per cent of the performing. Having performed, the Russians permitted themselves the luxury of a little boasting. What they have done, they said in Moscow, “will pave the way for space travel.” Just last week, they had forecast rocket flights to the Moon and Mars within a decade. Both the U.S. and USSR undertook to send instrument-laden moons into space as part of the International Geophysical Year (IGY), a cooperative venture of 64 countries and some 10,000 scientists to strip away mysteries still veiling the earth. All IGY nations are pledged to keep each other informed of their projects and their results. The Russians, however, cloaked their satellite program in secrecy – until Friday. Even after their moon was in orbit and flashing radio signals sporadically picked up in this country and elsewhere, the Russians withheld for the time being data vital to precision tracking by other nations. The U.S. moved quickly to remedy this. Some 160 “moonwatch teams” in this and other nations went to work. Eleanor also sent this clipping from the Welch Daily News, October 14, 1957, page 9. Cameron, W. Va. (UP) Two residents of this small Marshall County community have laid claim to being the first in West Virginia to see the Russian satellite, Sputnik. Russell Mathews and a son, Mayes, 14, were trying out a pellet gun near here Sunday when they noticed a "spec" in the sky. Mathews said he sighted along the barrel of the gun and followed the large "spec" for about 30 seconds, or until it was no longer visible. He also pointed out the object to his son. The man said he was not sure whether the object may have been the satellite or its rocket. A short conference at home resulted in another visit where the shiny object had been seen. About 96 minutes later, the time it takes for the satellite or its rocket to circle the earth, the pair saw the "spec" again, Matthews said. But this time, he said, the spec was "not as clear, though still visible to the naked eye."